You knew it had to happen sooner or later. Occupy Atlanta is demanding that the Benedict Arnold Koch brothers take their money out of politics. 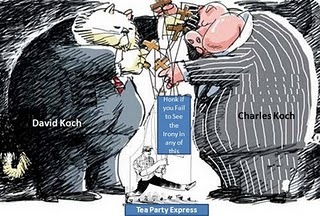 We demand that the Koch brothers withdraw all of their money from politics by 5:00pm on Tuesday October 27th. If they do not capitulate we will levitate the Georgia Pacific headquarters where they do their business. Capitulation or levitation? The choice is theirs. Occupy Atlanta is taking a page from the antiwar movement of the 1960s. Protesters threatened to levitate the Pentagon. It didn't work, but it got some attention.